This Ham and Broccoli Casserole is filled with ham, broccoli, and rice with a creamy white sauce, topped with a blend of pepper-jack, Colby cheese, and Panko bread crumbs. It’s a great way to use up leftover ham! There is just something about this Ham and Broccoli Casserole that my family just loves. I’ve been making it since before my girls were born and each time it just gets better and better. Each time I think it’s perfected and then the next time I make it, it’s even better. It’s typically made after I’ve baked a ham using the leftover ham and sometimes the vegetables for the casserole. Over the years, I’ve changed up the vegetables by using cauliflower or California mix but the ham and rice are always there. 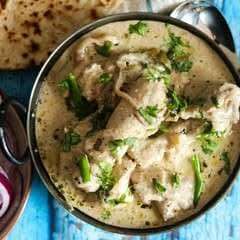 Despite the more than a couple of preparation steps in this recipe, it is well worth the time to put it all together. I’ve stream-lined the recipe so that while you are making the white sauce, the rice and the vegetables are cooking. Cutting the ham into bite-size pieces the night before eliminates that step and you can even chop up the onion and garlic the night before and keep in a well-covered container in the refrigerator till cooking time. 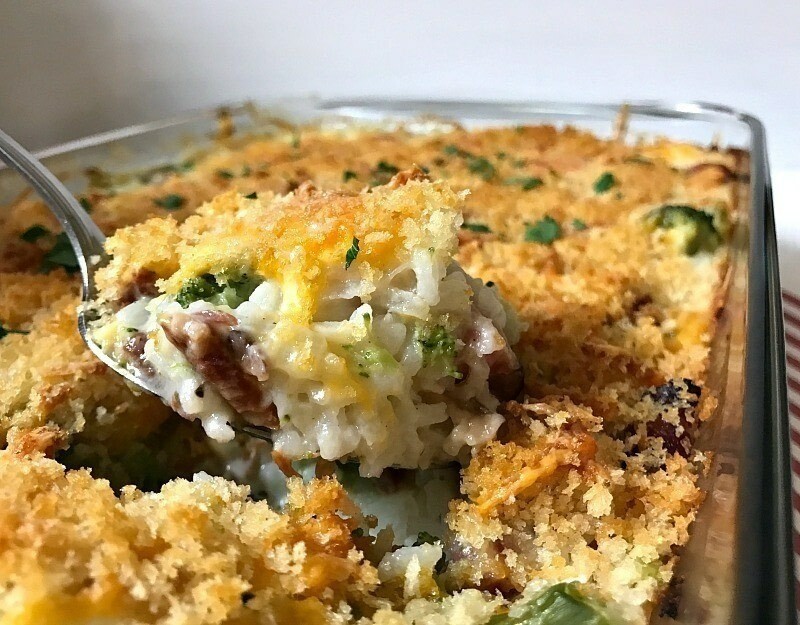 I prefer to grate the cheese fresh but I’ve also used prepackaged shredded cheeses to save time. Whatever works for you, is the key. Preheat oven to 375 degrees. Spray a 13 x 9 inch baking dish with non-stick spray. Cook the rice according to package directions. When done, leave covered to keep warm and set aside. Steam the broccoli to almost tender. It will continue to cook once it is in the oven. You want the broccoli to still have a bit of a bite to it, not mushy. Once cooked, drain, and keep covered, set aside. Mix together in a small bowl the Panko bread crumbs and 2 tablespoons melted butter. Set aside. While the rice and the broccoli are cooking, heat 4 tablespoons of butter over medium heat in a large skillet. Add the onion and saute until clear, about 3 – 4 minutes. Add the garlic and let cook another minute. Mix in the flour and let cook one minute. Slowly add in the milk (start with 3 cups), whisking constantly to get the lumps out and the flour mixture incorporated into the milk. Season with salt and pepper, to taste. Whisk until it begins to thicken and then add the ham. Heat through. *At this point, you may need to add more milk (I usually add about one cup more) to thin out the sauce just a bit. It will keep thickening as it heats. Once the ham is heated through, add in the broccoli and give it all a stir. Remove from heat. 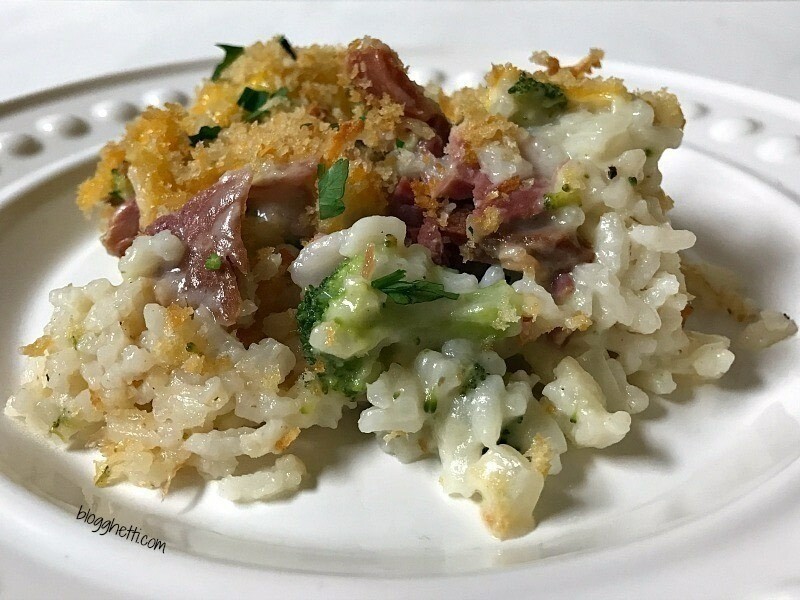 In your prepared baking dish, spread out the rice and pour the ham and broccoli sauce mixture over the rice. Give it a little stir to allow the sauce to seep through the rice. 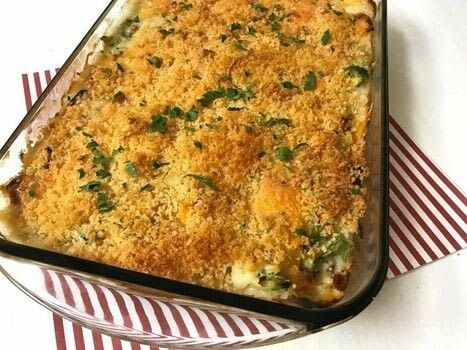 Top with cheeses and sprinkle with the butter-coated breadcrumbs. Bake for 30-45 minutes, until heated through and bubbly. If the bread crumbs start to get too brown, loosely cover with foil.